Derek Carr, the Raiders starting quarterback injured his right thumb while stiff arming corner-back Adam "Pacman" Jones in their week 1 loss to the Cincinnati Bengals. At the time of the injury the Raiders were only down 10-0 and were on the verge of being in field goal range when Derek Carr got injured and the wheels fell off for the Raiders. X-rays on Carr's thumb came back negative, which was a huge blessing for the Raiders organization. Expectations are high for Derek Carr and the Raiders offense after Derek Carr had a good rookie season completing 58% of his passes, while throwing 21 TDs and 12 interceptions. Derek Carr was a full participant in practice all week and should play Sunday versus the NFL's 2nd best pass defense in the league. It will be a very tough matchup for the Raiders offense, but with the injury to Terrell Suggs and having Derek Carr back gives the Raiders a chance. The Raiders did a good job in the offseason by bringing in some help for Derek Carr by signing Michael Crabtree during free agency and by drafting Amari Cooper with their first pick. They were also able to draft my top ranked tight end, Clive Walford. Cooper led the team in targets last week versus the Bengals, but he only caught 5 of them, which is just only 55% and he only averaged just over 9 yards per catch. 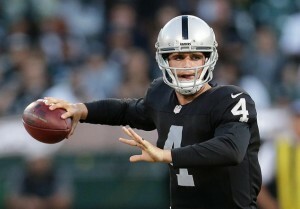 Part of the struggles Cooper had could be the fact that the Raiders had Matt McGloin at quarterback instead of Carr. Crabtree got the 2nd most targets in week 1 with 8 targets and he caught 5 of them, which is 63%. But, his yards per catch average was only 7.4 yards per catch, which is way too low. One negative about Crabtree is that he doesn't have great speed, but he has very good size. He needs to do a better job of running after the catch. Latavius Murray was 3rd on the team with 7 targets and he caught all 7 of them. This shows how good of a receiver Murray is, but bad for the Raiders offense to have their running back catch so many passes. Murray also only averaged 5 yards per catch. The Raiders need to get the ball down the field and Murray should only catch 3 or 4 passes, not 7. Rookie tight end Clive Walford needs to step up in the worst way and give Derek Carr a weapon in the middle of the field to take some pressure off of Cooper and Crabtree. Walford missed a lot of training camp with injuries, but the Raiders need him to be ready. Bill Musgrove, the Raiders offensive coordinator needs to run the ball more than they did versus the Bengals and then play action pass off their running game. That will keep Derek Carr healthy and will give them a better chance of making big plays. Derek Carr is definitely a quarterback to keep your eye on especially if you are in a keeper or dynasty league. He has good young weapons around him in Amari Cooper, Clive Walford, and Latavius Murray. Carr does a good job of protecting the football and he will keep getting better and better as this season and his career goes along.